Here you can find LG G Watch R W110 firmware download. Usually we offer firmware for smartphones, buy today we would like to present you the list of firmware for smart watch LG G Watch R W110. The first thing you need to know about LG G Watch R W110 is its operating system Android Wear. Also it comes with nice screen, powerful hardware and interesting features. It has 1.3-inch screen with resolution 320x200 pixel. If this is not enough for smartphone, it is a great resolution for smart watch. Also LG G Watch R W110 works on Snapdragon 400 processor and 512 MB of RAM. As for internal memory, 4GB is available for user. The important part of any modern smart watch is battery. LG G Watch R W110 is equipped with 410 mAh battery that provides one working day of battery life. So, we look at smart watch features, and now we can go to LG G Watch R W110 firmware download. As you may know, Google and LG do not release stock (factory) images of firmware for smart watches. So, there are no full official images including bootloader, system, kernel and recovery. But you can flash individual partitions (system, boot, recovery) or OTA-images using ADB Sideload. Here you can download partitions System, Boot, Recovery and a full .zip-image for flashing through recovery and via Fastboot. Also we offer you to download official OTA-updates from Google servers. 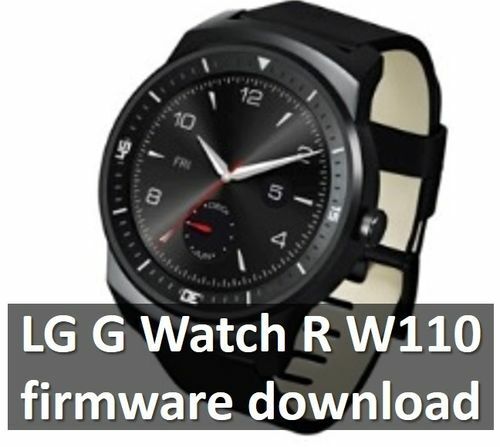 Our list of LG G Watch R w110 firmware download should help you. If you have any question, write in comment below.